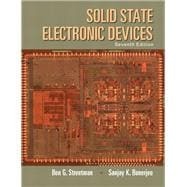 One of the most widely used introductory books on semiconductor materials, physics, devices and technology, Solid State Electronic Devices aims to: 1) develop basic semiconductor physics concepts, so students can better understand current and future devices; and 2) provide a sound understanding of current semiconductor devices and technology, so that their applications to electronic and optoelectronic circuits and systems can be appreciated. Students are brought to a level of understanding that will enable them to read much of the current literature on new devices and applications. Provide a Sound Understanding of Current Semiconductor Devices: With this background, students will be able to see how their applications to electronic and optoelectronic circuits and systems are meaningful. Incorporate the Basics of Semiconductor Materials and Conduction Processes in Solids: Most of the commonly used semiconductor terms and concepts are introduced and related to a broad range of devices. Develop Basic Semiconductor Physics Concepts: With this background, students will be better able to understand current and future devices. Ben G. Streetman is Dean Emeritus of the College of Engineering at The University of Texas at Austin. He is an Emeritus Professor of Electrical and Computer Engineering, where he held the Dula D. Cockrell Centennial Chair. He was the founding Director of the Microelectronics Research Center (1984—96). His teaching and research interests involve semiconductor materials and devices. After receiving a Ph.D. from The University of Texas at Austin (1966) he was on the faculty (1966–1982) of the University of Illinois at Urbana-Champaign. He returned to The University of Texas at Austin in 1982. His honors include the Education Medal of the Institute of Electrical and Electronics Engineers (IEEE), the Frederick Emmons Terman Medal of the American Society for Engineering Education (ASEE), and the Heinrich Welker Medal from the International Conference on Compound Semiconductors. He is a member of the National Academy of Engineering and the American Academy of Arts and Sciences. He is a Fellow of the IEEE and the Electrochemical Society. He has been honored as a Distinguished Alumnus of The University of Texas at Austin and as a Distinguished Graduate of the UT College of Engineering. He has received the General Dynamics Award for Excellence in Engineering Teaching, and was honored by the Parents’ Association as a Teaching Fellow for outstanding teaching of undergraduates. He has served on numerous panels and committees in industry and government, and several corporate boards. He has published more than 290 articles in the technical literature. Thirty five students of Electrical and Computer Engineering have received their Ph.D. under his supervision. Sanjay Kumar Banerjee is the Cockrell Chair Professor of Electrical and Computer Engineering, and Director of the Microelectronics Research Center at The University of Texas at Austin. He has more than 900 archival refereed publications and conference papers, 30 U.S. patents, and has supervised 50 Ph.D. students. His honors include the NSF Presidential Young Investigator Award (1988), ECS Callinan Award (2003) and IEEE Grove Award (2014). He is a Fellow of IEEE, APS and AAAS.